Tourism in Myanmar is growing rapidly and has the potential to create financial prosperity across the entire country. PfC cooperates with local partners to increase the skills level locally, and to provide strategic and financial support to the tourist industry. 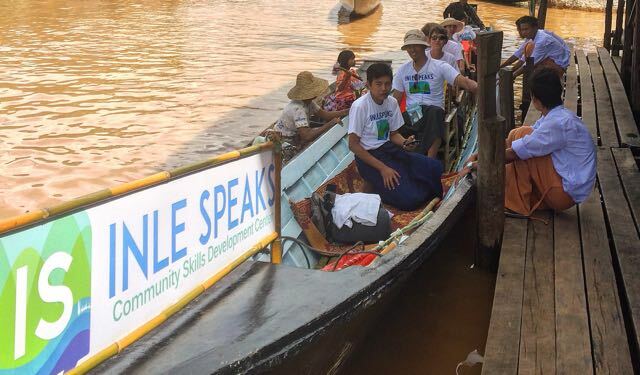 In cooperation with the Ministry of Hotels and Tourism (MoHT), PfC is working to implement a Destination Management Plan for the Inle Lake area. There is a great demand for staff in the hospitality industry. The same is true for tourist guides. Inle Speaks Centre is a hub for the population in the area, local authorities and organisations wishing to work for improvements in the sector. Most of PfC’s operations in this area are channelled through the centre. Among other things, PfC offers a comprehensive English learning programme as English is a much sought-after skill in a region that is attracting more and more international tourism. Another step in our work to develop the Inle Lake area as a tourist destination is the trademark Made in Inle which PfC has been actively involved in creating. The trademark Made in Inle is used for products – including traditional artisan products in textile and ceramics – as a hallmark of quality and certification of local production. One example of PfC’s cooperation with local entrepreneurs is the establishment of the Inle Heritage Hospitality Vocational Training Centre (IHHVTC). Businesswoman and entrepreneur Yin Myo Su wanted to establish a technical vocational college to meet the hospitality industry’s growing need for skilled workers. PfC has worked closely with Yin Myo Su on developing the school and designing its curriculum. In the school’s first year, PfC provided two teachers and assisted with mentoring and financing loans and grants for the first students. The idea was to use the training centre as a hotel, enabling the students to gain direct work experience. The hotel’s activities would finance the educational programme, making the centre financially viable. PfC brokered a loan of USD 250,000 to build the hotel and the centre was completed in 2013. The hotel’s operations are now economically sustainable and by the end of 2016 the business have repaid the first USD 100,000 of the loan.